Nishi Enterprise is a leading designer and manufacturer of top grade conveyor pulley products that are used in the Indian markets as well as the rest of the world. We regularly design and develop cutting edge head or drive pulleys and tail or return pulleys for our clients that are available in a broad range of styles, sizes and types. Here at Nishi Enterprise, we can offer our clients with pulleys that are equipped with hot custom vulcanized rubber lagging that can work well for the needs of our clients. 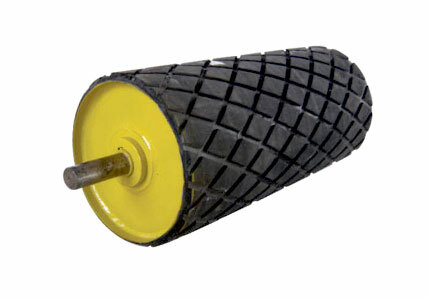 The rubber lagging may come in plain or grooved forms. Various patterns of grooving like diamond or herringbone can also be provided for increasing the tractive friction in case of wet or dirty conditions. The diamond grooves offer the distinct advantage of being suitable for any orientation or system, regardless of the belt direction. Head or drive pulleys are located at discharge terminus of a conveyor. These pulleys offer the main driving force for a conveyor. These pulleys usually have diameters that are larger than the other pulleys which in turn help them to have enhanced traction and pulley life. These pulleys drive the conveyor belt and are usually mounted with external bearings. An external driving source is used for driving this pulley. The return or tail pulley on the other hand is a type of conveyor pulley that is used to redirect the conveyor belt to drive pulley. The tail pulleys can make use of the internal bearings. They can also be mounted in the external bearings. Often they are located around the end of conveyor bed. The tail pulleys generally serve as take-up pulley on the shorter length conveyors. Why Use Our Conveyor Pulleys? 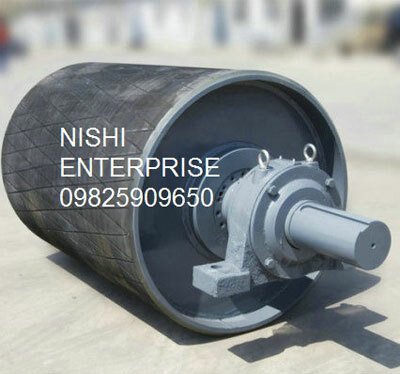 Being an industry leader when it comes to creating state of the art conveyor pulleys, we at Nishi Enterprise can deliver you powerful products that can be really beneficial for your company. All you need to do is get in touch with us and we can chat with you regarding the specific business goals you have in mind. Since we regularly create custom products for our clients, we have a flexible approach when it comes to designing such products. Industrial Pulleys and others based on specific requirements.